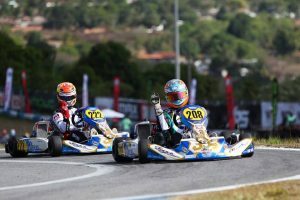 Eleven of the 12 Australian representatives at the 2018 Rotax MAX Challenge Grand Finals have made the transfer into the finals in Brazil. After crossing the line first in his pre-final, New South Wales driver Jaiden Pope will occupy the outside front row for the final in the Junior MAX class. He is joined inside the top ten by his Tom Williamson Motorsport team-mate William Seal who will start eighth. The third row of the starting grid in the DD2 class will be filled with Australian representatives withs Ryan Wood and Ryan Kennedy set to start fifth and sixth respectively. Damian Ward has been one of the hard chargers throughout the heat races to move up from his 44th qualifying position to 20th on the grid for the final. Queenslander Ben Jurczak will start ninth in the Senior MAX final with Josh Hart two places further back. In the DD2 Masters class, Trevor Whitby has secured a spot inside the final (21st) with fellow Australian Terry Hanly one row further back (23rd). Unfortunately Ashley Seward missed the cut by a handful of positions. Costa Toparis will start ninth in the Mini MAX final while Jake Rutkowski will be from 35th in Micro MAX.